David Eedle | Geek, tech, programmer, business owner. Serial starter of things. Occasional finisher. Oh, and please don't call me Dave. We’ve been giving Sodeco a try recently at ParentPaperwork, like most of these online tools there is a 14 day trial, after which you need to sign up for a subscription. 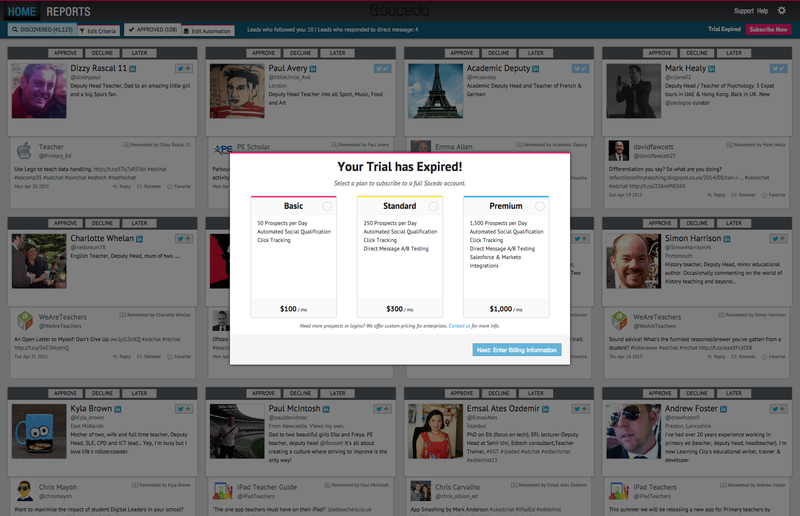 At the end of the trial we decided not to subscribe, we were not really seeing a marked result, and we have a great deal of other social and content promotion work underway, so adding another tool to the list was only going to happen if we really could see value returned. My problem arose when time came NOT to pay. A few days ago I received the usual prompt that my trial had ended and we needed to pay. Notice the wording in the email. I’m presented with two options – either I can subscribe, or my account will be deactivated. I’m not a big fan of web sites having my personal information unless really necessary, so ‘deactivation’ doesn’t really fit the bill for me. And given I’m in the SaaS game I’m presuming that leaves me open to ongoing marketing approaches. So I go to Socedo and login, thinking I must be able to locate an option to delete my account. Unfortunately not. After login a popup modal window opens presenting three subscription choices. I cannot close the modal, nor access my account information. I do not think this is acceptable, and I said so in an exchange with a Socedo support person. They deleted my account as I requested. 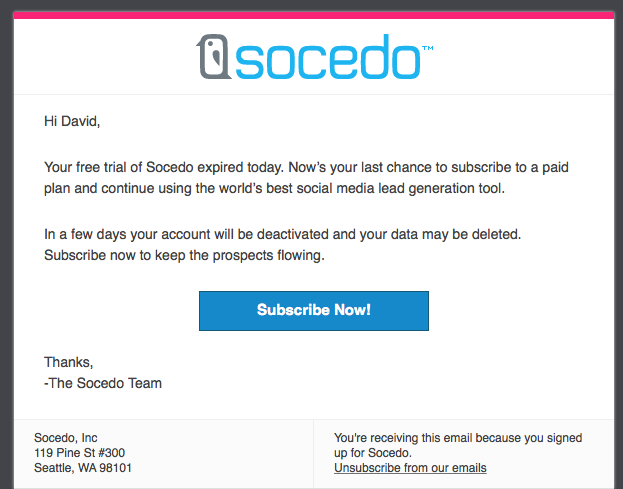 Socedo’s tactics are blatant, they are coming from the view that the best way to sell their product to a customer is to give the customer no choice. Companies need to recognise customers must be given choice – and one of those is not to purchase a product. Companies must also recognise that users must have the right to control their personal information. I will not do business with an online company that does not offer me the option to delete my account and the associated personal data they are holding. One of our main challenges in SaaS (or indeed marketing any product) is understanding why a customer chooses not to purchase. If we are smart, we can see these customers as opportunities.